Governor of Syria (39-42); died probably in the reign of Claudius. During his term of office Petronius had frequent opportunities to come in contact with the Jews of Judea and to confer benefits upon them. This was especially the case when the insane Emperor Caligula caused himself to be worshiped as a god throughout the Roman empire, so that the peril which had threatened the Jews of Alexandria became still greater in Palestine. 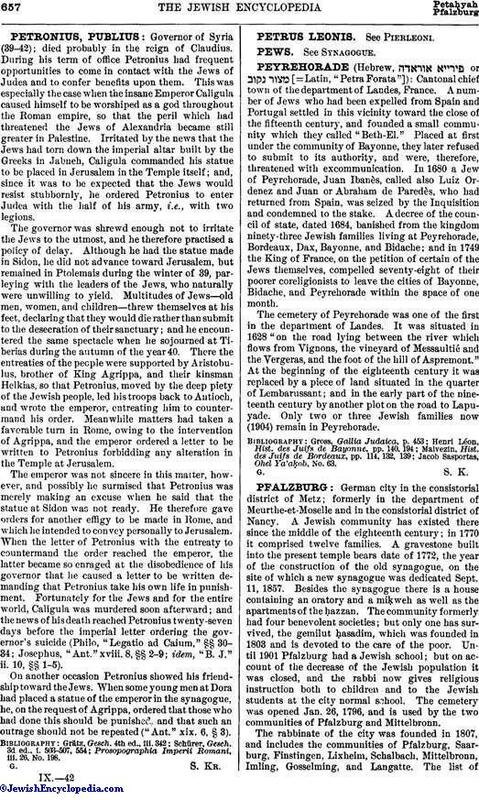 Irritated by the news that the Jews had torn down the imperial altar built by the Greeks in Jabneh, Caligula commanded his statue to be placed in Jerusalem in the Temple itself; and, since it was to be expected that the Jews would resist stubbornly, he ordered Petronius to enter Judea with the half of his army, i.e., with two legions. The governor was shrewd enough not to irritate the Jews to the utmost, and he therefore practised a policy of delay. Although he had the statue made in Sidon, he did not advance toward Jerusalem, but remained in Ptolemais during the winter of 39, parleying with the leaders of the Jews, who naturally were unwilling to yield. Multitudes of Jews—old men, women, and children—threw themselves at his feet, declaring that they would die rather than submit to the desecration of their sanctuary; and he encountered the same spectacle when he sojourned at Tiberias during the autumn of the year 40. There the entreaties of the people were supported by Aristobulus, brother of King Agrippa, and their kinsman Helkias, so that Petronius, moved by the deep piety of the Jewish people, led his troops back to Antioch, and wrote the emperor, entreating him to counter-mand his order. Meanwhile matters had taken a favorable turn in Rome, owing to the intervention of Agrippa, and the emperor ordered a letter to be written to Petronius forbidding any alteration in the Temple at Jerusalem. The emperor was not sincere in this matter, however, and possibly he surmised that Petronius was merely making an excuse when he said that the statue at Sidon was not ready. He therefore gave orders for another effigy to be made in Rome, and which he intended to convey personally to Jerusalem. When the letter of Petronius with the entreaty to countermand the order reached the emperor, the latter became so enraged at the disobedience of his governor that he caused a letter to be written demanding that Petronius take his own life in punishment. Fortunately for the Jews and for the entire world, Caligula was murdered soon afterward; and the news of his death reached Petronius twenty-seven days before the imperial letter ordering the governor's suicide (Philo, "Legatio ad Caium," §§ 30-34; Josephus, "Ant." xviii. 8, §§ 2-9; idem, "B. J." ii. 10, §§ 1-5). On another occasion Petronius showed his friendship toward the Jews. When some young men at Dora had placed a statue of the emperor in the synagogue, he, on the request of Agrippa, ordered that those who had done this should be punished, and that such an outrage should not be repeated ("Ant." xix. 6, § 3). Prosopographia Imperii Romani, iii. 26, No. 198.